The Art Profolio PolyZip Envelope seals out the elements to help resist dust and moisture. An expanding gusset provides flexible storage for a single or a stack of art and photo materials; Ideal for carrying supplies and organizing projects too. 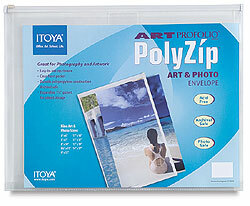 The Art Profolio PolyZip Envelope also has a single sheet pocket in the front for a routing slip or a content sample. Overall dimensions: 6-1/2" x 9" x 1/4"